Thanks Dawn! We had a lovely Valentine’s Day. I hope you guys did too. And I totally agree. I could make a meal on these potatoes and dip too! Thanks Terry! I gotta say, we’re enjoying our air fryer so far! Wow! We just got my sister-in-law an air fryer – now I need one! These look amazing!! I love how crispy they are!! Thanks Annie! We’re loving ours so far. And the crispy potatoes are on repeat! I love those tri-color baby potatoes! SO cute! I’ve been really thinking about investing in an air fryer and you’re definitely convincing me! They look so extra crunchy and delicious – and that cashew dip looks sooo creamy and spicy – the perfect balance! These would be awesome for an appetizer or hey, I would even eat them for a main dish! LOL! Happy Valentine’s Day, my friend! Thanks Haylie! Eating them as a main dish sounds good to me! Hope you and your hubby had a great Valentine’s Day too! Ok now I’m convinced I need to buy an air fryer!! 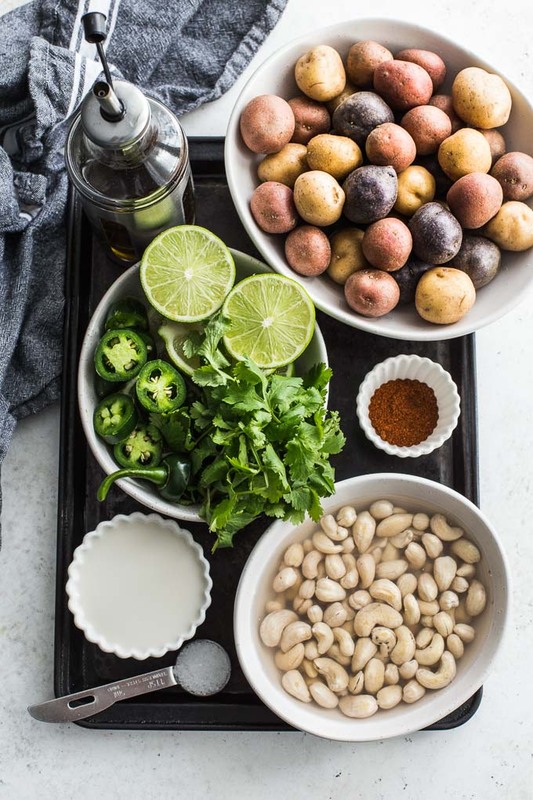 These potatoes look AMAZING and I love that you’ve been doing other things like chickpeas and chicken thighs!! That dip is also so delicious looking, Leanne. You’ve got my stomach rumbling! Thanks Katherine. Seriously, almost every meal I’m cooking something in the air fryer! Loving it so far! I’m so late to this party too. Hubby and I have been talking about getting an air-fryer for 2 years! We’ve just about decided we will. I’m pretty sure when I show him this recipe, we’ll be getting in the car to go get one. I also love those little tri-colour potatoes. Thanks Marie! 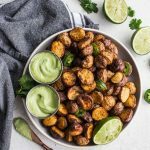 I’ve been buying these tri-colour pre-washed potatoes lately and they are so easy and perfect for the air fryer! Let me know if you get one! I do not have an air fryer yet, but a friend of mine does and loves it! These look delicious Leanne. And that jalpeno cashew dip sounds fabulous! Thanks Mary Ann! I’m so glad we got one. It has been a welcomed addition in our house! Happy weekend! Oh my gosh! These look AMAZING! I had no idea what an air fryer was until now. I need to investigate this contraption further. 😉 I love potatoes cooked in pretty much every way imaginable. 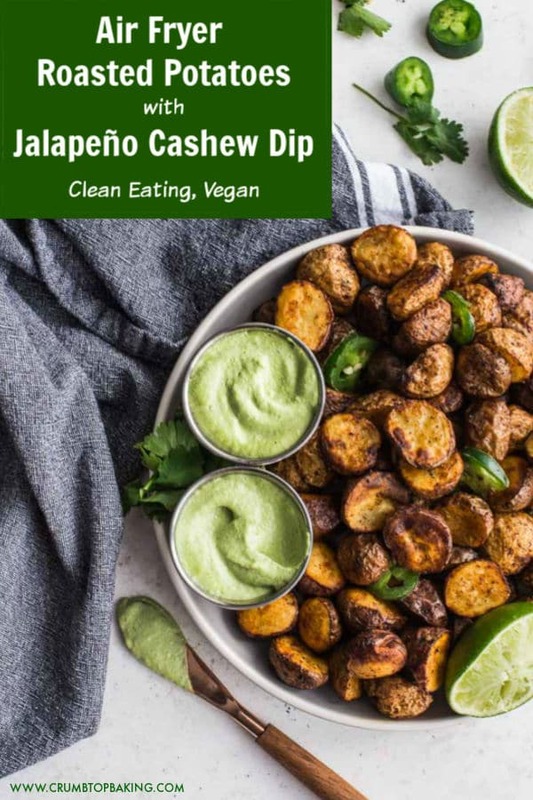 The Cashew Jalapeno dip seems like a really delicious pairing with the potatoes. Must try! Thanks Donna! We’re happy with our air fryer purchase, and roast potatoes in it quite a bit! The jalapeño dip is a new favourite. I’ve been making multiple batches a week! I’ve never used or eaten anything from an air fryer, but I’m convinced!! These potatoes look so crisp and delicious!! Love the dip too! Thanks Marissa! I hadn’t air fried anything until a few months ago, and now I use it almost every day! Hope you had a good weekend too! I just love potatoes!!. These look fabulous and that dip is the “icing on the cake”. All that flavor and spice has me drooling 🙂 . Take care. Thank you Stacey! Potatoes are a go-to side dish in our house. And we’re loving these for snacking too! Glad you like the look of the dip. It’s a keeper, for sure! That jalapeño cashew dip is ridiculously delicious! And I love how crispy the air fryer gets the potatoes. This will be a regular recipe for me. Thanks Amanda! The cashew dip is one of our favourites, and goes perfectly with the potatoes. 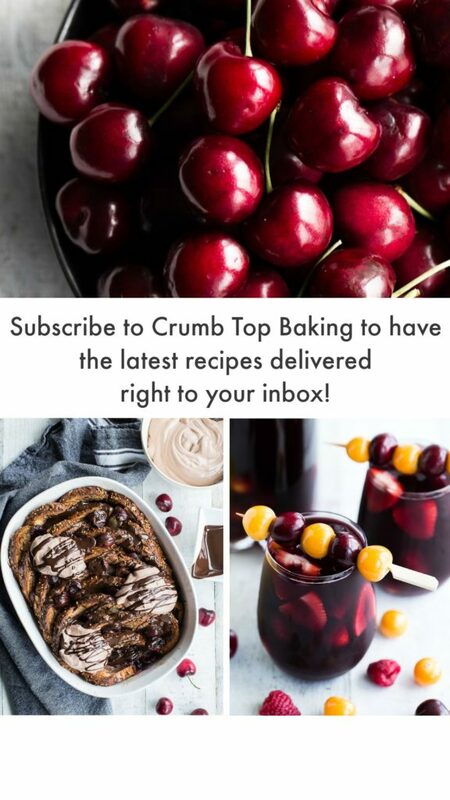 Would love to know what you think if you try the recipe! This looks amazing and that Jalapeno Dip is screaming my name! I currently do not own an air fryer but one day! Totally saving this recipe! Thanks Wanda! We are loving our air fryer! One of my favourite kitchen appliances lately! An air fryer is on my list of things to buy this year. Now I have a reason to get it asap. 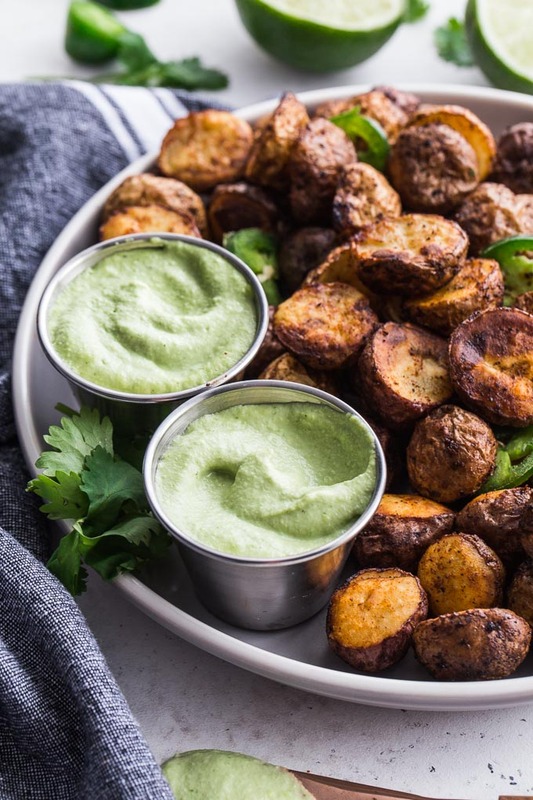 These air-fryer roasted potatoes look so delicious and the dip looks outstanding. Thanks Elaine! I’m so happy we finally bought an air fryer! We are getting so much use out of it! Thanks Aleta! Appetizer night happens quite a bit around here too! Hope you like these as much as we do! 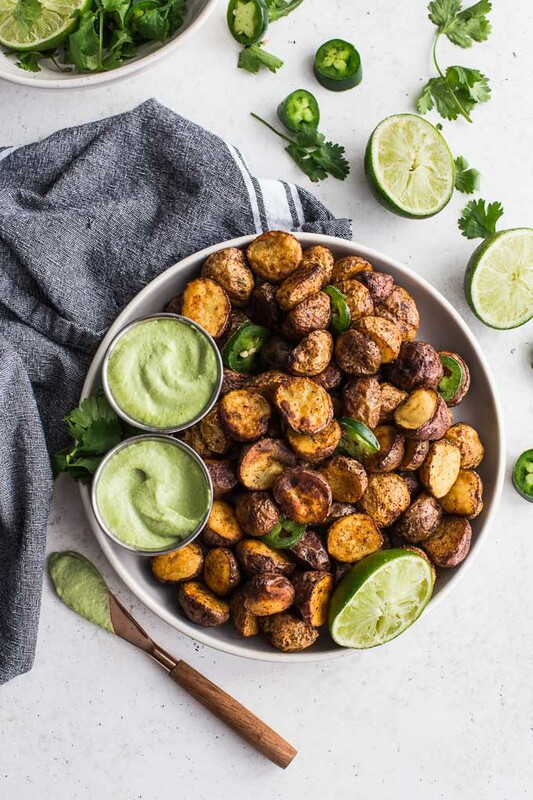 I think I might want to buy an air fryer JUST to make these potatoes!! And the dip?? You got me drooling! Also, I like your tip to get prewashed potatoes. Never got those before, but they sound like a major time saver! Thanks Cathleen! I air fry a lot of things lately, but the air fryer would have been worth it just for air frying potatoes! And I’m all about any pre-washed produce and saving time wherever I can! 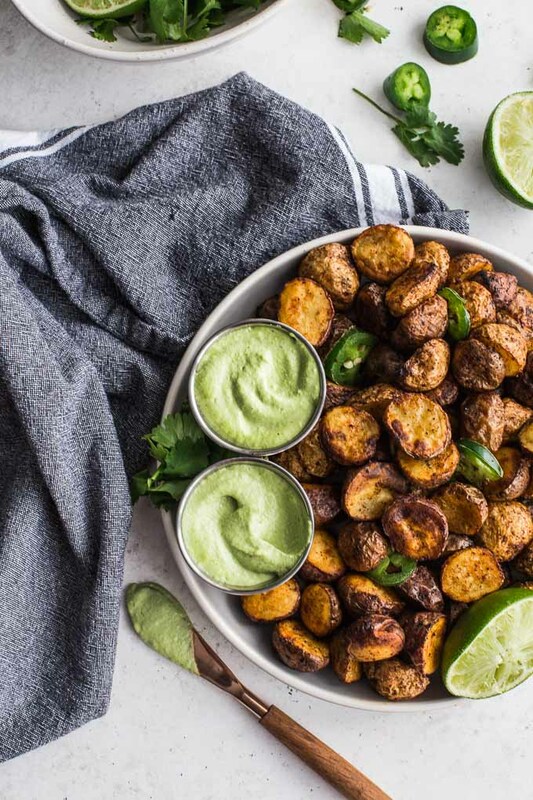 these look like the most delicious crispy fried potatoes! i need an air fryer. But that jalapeno cashew sauce….i’d eat that on anything! Thanks Danielle! We love our air fryer! And I will admit, the cashew sauce has been enjoyed with many different savoury dishes in our house. It’s so versatile! I just know I would not be able to stop eating these crispy little morsels of deliciousness. And that dip? Oh, yum! Thanks Kim! The cashew dip is a must try! I’d so love an air fryer, but sadly I have a small appliance obsession and too little space :(. But if I do sacrifice something else and get one, I’ll definitely be making this recipe- it looks sooo good! Haha! Thanks Terri! I understand the small appliance obsession! Wonderful description and even better pictures. I have never used an air fryer nor seen one before but the crispiness of those potatoes are convincing me this would be a wise investment. Thanks Analida! I’ve been using my air fryer quite a bit lately. I’m happy we invested in one! You have me so tempted to get an air fryer simply so I can make this recipe! The jalapeño cashew dip sounds perfect to go with these too! Haha! Thanks Vanessa! I make this recipe almost every week in my air fryer. Actually it’s multiple times a week! I adore using my air fryer and always looking for new recipes to make using it. 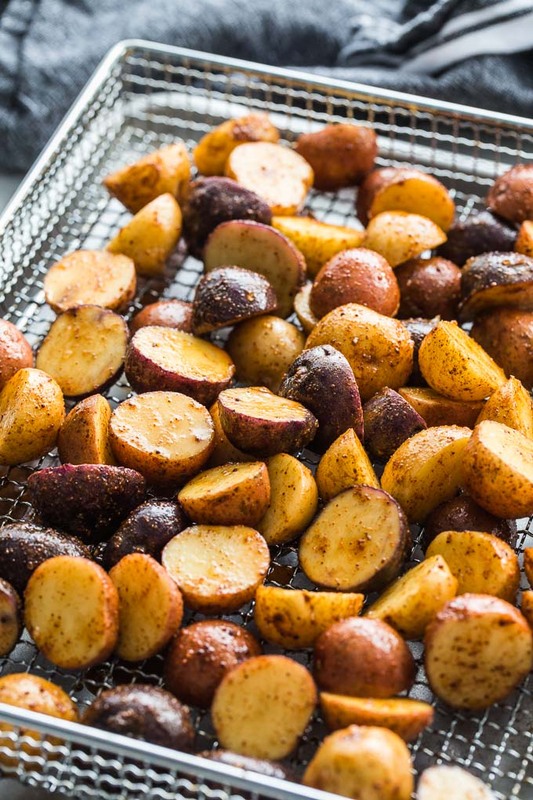 These potatoes look like a perfect side dish or snack. Thanks Sharon! Yes, we’ve enjoyed these potatoes for Friday night snacking, and as a side dish too! This recipe might have just convinced me to get an air fryer! That dipping sauce looks amazing and the potatoes look perfectly crisp! Can’t wait to try this recipe! Thanks Kylie! We get a lot of use out of our air fryer! I just got an Air Fryer and I am trying several different recipes. I am going to add yours to the list. Thanks Nicole! Would love to know what you think if you try this recipe! I can’t wait to make these in my air fryer. I just recently purchased one and it gets used almost daily. I use mine almost daily too! Hope you get the chance to try these potatoes! Thanks Deseree! These air fryer potatoes look fantastic and like they have just the right amount of crisp on them. Time to dust my air fryer off!